Spoil Yourself with This Executive Home! You've worked hard... the kids are more independent and it's time to spoil yourself.Private, sheltered, sunny and beautifully presented with four bedrooms, three bathrooms (with underfloor heating), two living areas and a huge study... you'll be able to host a raft of visitors in this entertainer's delight! Our owners built, brought their family up here, and have modernised this special property for contemporary comfort. They are now heading up north - your chance to get into this exclusive home. The first thing you'll notice is the stunning street appeal against a backdrop of established trees and bursting with colour. You'll be proud to call this home. On cooler nights the double-glazing, insulation in the walls and ceiling and four heat pumps will keep your family warm and toasty. The lounge leads out to a sheltered deck, perfect for relaxing. On this entry floor a bedroom with ensuite will suit parents or visitors. Upstairs, the spacious open plan hub of the home, an exquisite designer kitchen, well-appointed with superior fittings including two dishwashers for easy clean up after a night of entertaining which leads to a deck for BBQs overlooking the beautiful garden. There is also a second living space, with its own patio, and a huge home office. Upstairs again, the master is particularly spacious - bliss - with the main bathroom and lastly two good-sized bedrooms, one double with access to another bathroom. If the owners had to pick one stand out feature, it would be the meticulously maintained private and sunny outdoor areas. Fitted with brick paving, hardwood decks and stonework terraced gardens, bird baths, seating and entertainment areas plus a water feature. It's well suited for special occasions like weddings and birthdays. Add to this plenty of storage, and a large double internal access garage. All in a sought-after location, near the Churton Park shops, a minute from the bus and a short walk to kindy's and schools. A Builder's and LIM Report are available. Call us now! RV $990,000. 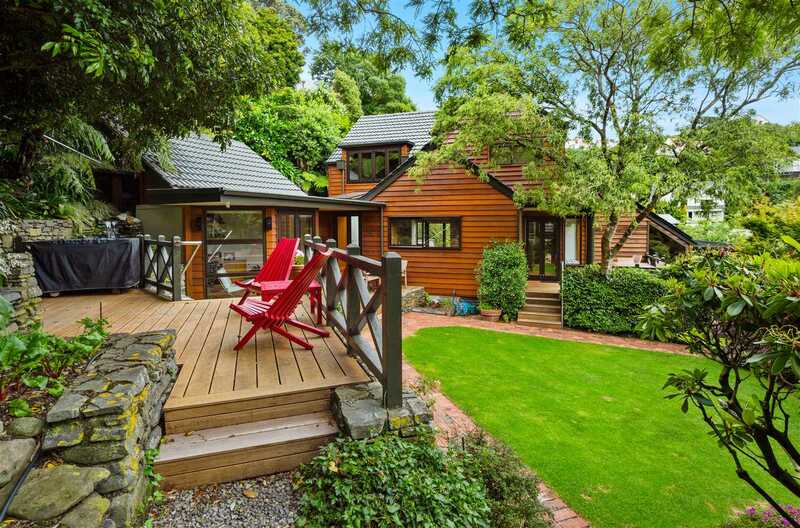 Fixtures/chattels excluded: Kowhai art affixed to exterior of house above deck.